Erhun Oztumer scored the winner. Attacking midfielder Erhun Oztumer scored the only goal of the game as the Peterborough United reserve ream beat a strong Rotherham United line-up at the Mick George Training Academy yesterday (August 12). Oztumer scored a free-kick from 20-yards to settle proceedings in what was a lively contest with both sides creating chances in a fixture that was arranged as two 30-minute halves. Kyle Vassell and Jack Payne both saw efforts tipped over the bar and Lee Angol was denied by Adam Collin in the Rotherham goal. 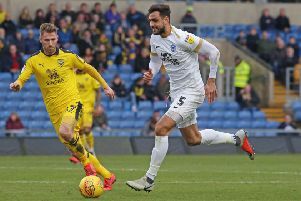 Ricardo Almeida Santos, Souleymane Coulibaly and Shaun Brisley all featured in the Posh line-up as the whole squad was utlised this week following the Capital One success over Crawley Town. Rotherham included former Posh striker Jonson Clarke-Harris in their line-up with boss Steve Evans watching on from the sidelines. Posh: Henry, Beautyman (sub Robinson), Brisley, Almeida Santos, Fox, Sadlier, Payne, Oztumer, Coulibaly, Vassell, Angol.